The interest in Beethoven lies not only in his music, much of which is tremendously powerful, but also in his historical significance – the great, unprecedented impact he had on his contemporaries and the changes he seems to have wrought on Western tonal art and aesthetic thinking. In advance of his upcoming course Beethoven: Music and Ideals, faculty member Nathan Shields sat down with BISR to discuss Beethoven’s extraordinary singularity – what explains the fierce originality of his compositions? From what cultural and political sources did Beethoven draw? As a transitional figure, how does Beethoven complicate our notions of Romanticism and its relation to Enlightenment? Finally, if Nathan, like Schubert, were on his deathbed, what Beethoven piece would he, in his waning hours, most like to hear? Beethoven’s famous works feature a monumentalism, a bombast, that was fairly new in Western music, and his originality was recognized, indeed, idolized, instantly by his contemporaries. How is Beethoven’s singularity to be explained? What drove Beethoven to compose as he did? Was he simply a “genius,” a man outside his time? Or were Beethoven’s mature style and technique to some degree socially determined – enabled or made suddenly possible by economic, technical, cultural and/or political forces? I think it’s essential to an adequate historical understanding of Beethoven, and of his cultural milieu, that we realize the two interpretations of him you suggested aren’t mutually exclusive. In fact, I would argue that they’re interdependent. He really was a solitary, asocial genius, and it’s precisely in this that he embodied cultural and artistic possibilities that would have been unavailable to a composer born even twenty years earlier. Some of the reasons for this are easy to define, while others are more elusive but to my mind more profound. 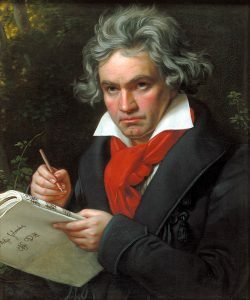 The former include, for example, the changing social role of the artist: Beethoven’s famous boast to an aristocratic patron that “there are many princes, but only one Beethoven” is the kind of thing that it’s impossible to imagine Bach or even Mozart saying (though the latter might have wanted to). This is not just because princes mattered more in the eyes of their contemporaries during the days of the ancién regime, but because composers mattered less. They were artisans, usually servants of court or church, producing work to suit the needs of their employers. But by the time of Beethoven’s death they had come to see themselves, as his contemporary Shelley said of himself and his fellow poets, as “the unacknowledged legislators of the world.” If Beethoven was an important agent of this transformation, he was also its beneficiary. His symphonies, in particular, are models of music as a kind of public rhetoric: they exhort, cajole, and even shock the listener, and do so in the service of a determinate ethical vision. To the extent that this was possible before, it was in liturgical music, where that ethical vision was the Church’s. In Beethoven it is the artist’s own, and he speaks to us not on behalf of a particular ecclesial community but as himself, directly. It’s this “himself,” however, that’s probably the most revolutionary thing we encounter in Beethoven—an introspective, self-analytical subject whose novelty we easily miss only because we now take it so much for granted. Beethoven came of age during the Goethezeit, the “age of Goethe,” and his music, like Goethe’s novels, is preoccupied with the minute exploration of inner life and the development of the individual. But unlike Goethe, who was fifteen years his senior, Beethoven was young enough to be decisively shaped by the French Revolution, and by the sense—common in its aftermath—that history, after a period of relative quiescence, had lurched violently into motion. The self depicted in Beethoven’s music is thus immersed in history in a way that Goethe’s protagonists are not; its development is marked by struggle and violent antitheses, leading often toward some exalting transformation. In this respect the closest parallel to Beethoven among his contemporaries is not Goethe, but Hegel. Hopefully this goes some way toward suggesting the interdependence of your two versions of Beethoven, the genius and the man of his time. Lonely, despairing, and ultimately triumphant struggle—which we associate, rightly or wrongly, with the whole idea of artistic genius—is both a real fact of his biography, and an essential part of the narrative we encounter in his music. But it was also an essential part of the way in which his time came to see the self, its relation to others, and its place in history. In a sense Beethoven most fully embodied that age’s aspirations precisely where he seemed most to stand outside it. Beethoven’s lifetime straddles the Enlightenment and its development into what’s often thought of as the Romantic reaction. Looking at the portraiture and hearing the expressiveness of the later music, it’s easy to say Beethoven’s a Romantic. Then we recall: Beethoven was a freemason, and his grandiose 9th symphony is a setting of Schiller’s ode to universal brotherhood. Culturally speaking, how is Beethoven to be understood? If he’s a transitional figure on the continuum from Enlightenment to Romanticism, what does that say about the apparent polarity of the two traditions, which are often framed as opposites? Certainly when it comes to music, our distinctions between them crumble as soon as we start to examine them closely, in ways that I think are suggestive about how we think of the Enlightenment and Romanticism more broadly. Consider for example what’s called the “classical style,” the musical dialect that Beethoven inherited from Haydn and Mozart. There’s a reason it’s called classical: as a mode of musical communication, it’s built around the elaborate establishment, disruption, and reassertion of symmetries, the delicate play of balance and imbalance in harmony, rhythm, and form, and the interplay of clearly enunciated and distinct musical ideas. This could be seen, and often is seen, as the embodiment in music of the Enlightenment’s fundamental ideals. The Thomist moral philosopher Alasdair MacIntyre went so far as to say that the greatest figures of the Enlightenment were both Austro-German: Mozart and Kant. What we tend to forget, on the other hand, is that when E.T.A. Hoffmann, the most perceptive of Beethoven’s early critics, claimed Beethoven for Romanticism, he did the same with Mozart and Haydn. And as you inspect Mozart more closely, this claim seems to be justified in numerous ways. In a work like Don Giovanni, that same classical style, supposedly the epitome of musical rationality, is used to suggest dangerous irrationalities and demonic depths of experience. In his great essay on Don Giovanni, Kierkegaard claimed that the category of the “demonic/sensual” was created by Christianity, which posits it as its own negation. Something similar could be said about the classical style and Romanticism: musical Romanticism is, at least in part, an exploration of those irrationalities that the classical style posited as its negation. The order even of Haydn’s most orderly music relies for dramatic force and piquancy on a disorder that is constantly threatened and averted. Conversely, the asymmetries and vertiginous depths of musical Romanticism—in Schubert or Schumann, for example—are understood as such only against the background of the classical style, which functions for the early Romantics as a norm and a point of departure. This is suggestive, I think, of the larger ways in which Romanticism was not simply a rebellion against the Enlightenment but an outgrowth of it. A parallel case might be found in the way Kant, the supreme philosophical figure of the German Enlightenment, laid the ground for Romantic philosophy. I think for example of Heinrich Heine’s description of Kant’s regular morning walks—Heine claimed that if the friendly fellow townsmen Kant met on his way had understood the import of his thought, they would have “trembled before him as before the headsman’s axe.” Beethoven exhibits that same seeming duality, simultaneously apostle of reason and dangerous revolutionary. Beethoven famously dedicated his 3rd symphony to Napoleon but later soured on the French leader when Bonaparte crowned himself emperor and seemingly betrayed the principles of the French Revolution. What, if any, are the relationships between Beethoven’s innovations in music and his political idealism? Although this story is sometimes overplayed in musicology circles, I think both Beethoven’s revolutionary sympathies and his attitude toward Napoleon himself connect to things that are fundamental to his music. The former are reflected in his musical rhetoric, which as I mentioned above is essentially public, at least in the symphonies—directed not just toward aristocratic cognoscenti but toward large crowds, and pitched not only to please or persuade but to thrill. The dedication of the Eroica to Napoleon, on the other hand, is a reminder that politics for Beethoven was not just a realm of mass movements. Like Hegel, whose “world-historical individuals” manifested the spirit [Geist] of the age through their own deeds, he envisioned a political stage on which individual actors cast long shadows. In many of his symphonies, massed orchestral passages alternate with moments of startling, chamber-music-like intimacy, public life with private. The result of this is that, even as a piece like the Eroica seems to depict grand historical events, we never entirely lose the sense that those events are happening to a particular person. This aspect of his music has made it vulnerable to appropriation by various cults of personality, and in turn to a backlash that denies its political implications altogether—as Arturo Toscanini purportedly said of the Eroica, “some say that this is Napoleon, some Hitler, some Mussolini. For me it is simply allegro con brio.” But it is also a central part of what makes him compelling. While the symphony lasts, its subject seems to be not so much Napoleon, or even Beethoven, but the listener, who experiences himself or herself alternately as private individual, as member of a collectivity, and as world-historical actor. This is a peculiarity of the experience of Beethoven whose political implications have not, I think, been fully drawn out. On his deathbed, Franz Schubert is said to have requested a performance of Beethoven’s C sharp minor String Quartet, Op. 131. If you had but one Beethoven piece to listen to, what would it be? I’d probably choose either the Ninth Symphony or the piece that directly follows Schubert’s choice in Beethoven’s catalogue, the Quartet in A minor, op. 132. Certainly if I were on my deathbed I’d opt for the latter, one of the most emblematic of Beethoven’s mysterious, gnarled late works. Pieces like Beethoven’s last quartets and the Missa Solemnis, which bewildered many of even his most admiring contemporaries, are among the principal inspirations behind our whole idea of “late style”—which is “furrowed [and] ravaged,” in Adorno’s words, and marked by the proximity of death. Yet the late works are also capable of disarming, almost shocking simplicity, as in the A minor Quartet’s third movement. This movement, which Beethoven wrote while he was recovering from a severe illness, is subtitled “holy song of thanks to the godhead from a convalescent,” and in it his late style is suffused with the stark plainness and otherworldly serenity of high Renaissance polyphony. I feel a bit young to be deciding what music I want to die to, but I suppose if I have to pick something, it’d be that. Correction: the original version of this interview misstated the order of the movements of Beethoven’s String Quartet in A minor, op. 132. The “holy song of thanks to the godhead from a convalescent” is the third movement, not the second.